My daffodil just bloom this week. When I took this photo I didn't noticed there is some kind of a bug in one of the petal but it turn out really cute! Great Color Carnival photos, Macro Flowers and Today's Flowers too! Beautiful daffodil! Loved the white and the yellow orange in the middle. Lovely daffodil, but the eye is drawn inevitably to the intruder... anyway, Happy Mother's Day! Lovely daffodil macro, excellent, sharp shot. Thanks for sharing it on Macro Flowers Saturday. One thing i like about daffodils is that deer tend to avoid them. I have a love and hate relationship with deer, they love to eat my plants! Happy Mother's Day, Mng Kim! Oh so beautiful, and a great capture of the little bug. Thanks for sharing. This is such a gorgeous daffodil...Very beautifully presented, too! I love the bright orange ring inside, a lovely surprise. Great shot on your beutiful Daffodil. 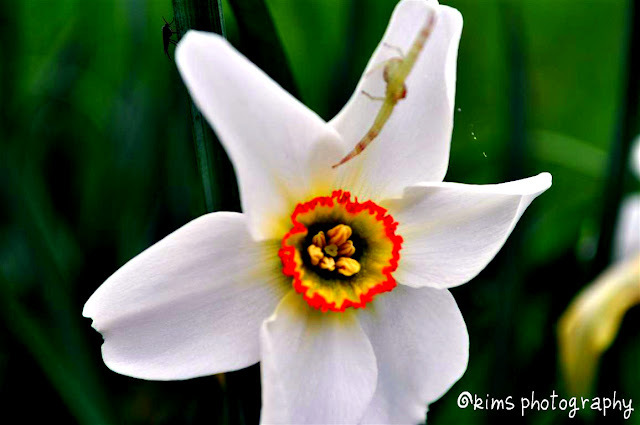 I think it´s a spider that is crawling around in the flower ? What an awesome capture! PERFECT! what a wonderful explosion of colour in the center...looks like someone likes it! lovely colour combinations with white background:) it's a great shot!